If you love baking and don't own a copy of Short and Sweet by Dan Lepard, then why not? It's the one cookbook that I bought on recommendation, have never regretted buying and don't know anyone who has a bad word to say about it (other than that the cover could be a bit more robust). I first happened across Dan when I was looking for a recipe for proper soft baps. The husband doesn't like anything crunchy and so a lot of Googling (this was in my pre-blog and pre-Twitter days) turned up a rather involved recipe to deliver a home made version of that preservative-filled supermarket staple of which the husband is so enamoured. Several hours later, I served up the baps, only to be told they were too sweet. For once, I'll give him that. They were too much on the sweet side to be suitable for the savoury pap the husband would eat in them. But then again,with the right filling, the slight sweetness might have worked really well. All in all though, the recipe was easy to follow, and the bake delivered exactly what it said it would. Which is why I love Short and Sweet and why I'm so happy today with the lovely danish recipe published in last week's Guardian. I've been so excited about trying this recipe since Dan tweeted some pics a couple of weeks ago. And after my disasterous attempt at laminated danish dough just before Christmas, the thought of a Dan Lepard recipe that delivered fresh chocolate danish straight from the oven was almost too much for me. Rather than using a cold sheet of butter, Lepard's recipe is more like making rough puff. The butter goes into the dough mixture in 1cm cubes and then you proceed with three lots of rolling and folding times three plus chilling. Simple maths. Except when I read they were quick and easy, I neglected to realise that this still meant it was quite a long process. There's an hour for the sponge to bubble, three lots of rolling and folding plus 3 x 30 minutes of resting, shaping, rising and baking. So still nearly four hours effort if you're really quick at it. And more if you've a stroppy toddler to feed and dress in the middle. When Dan says 'Roll them tightly' he means roll them tightly! That said, the effort truly is minimal. The recipe worked like a dream and my only problem was with the shaping. 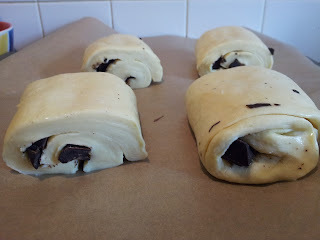 I didn't roll them tightly enough and ended up with a bit of a chocolate escape. They also could've done with a bit longer baking because they browned really quickly so I took them out before they burned. I should've just trusted the Master's timing and left them for five minutes more. 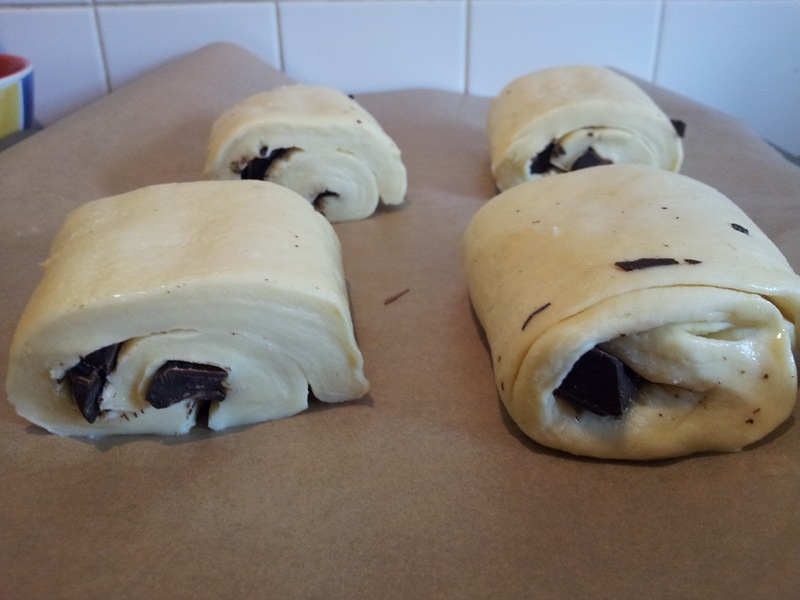 I only used half the dough to make my four chocolate danish. The rest is in the fridge so I can have a go at something else (apricot danish) on Tuesday morning for breakfast (and so I can see if the dough keeps well enough for 48 hours). I would also recommend using a 50 or 60% chocolate. I went for 70% and it was a little too dark for me. Plus I'm not sure if Dan eats a lot of the chocolate while he's shaping the danish, but I probably only used about 50g of chocolate for four danish (and these leaked everywhere). Dan recommends 200g for eight. The instructions are excellent as always and I was so chuffed that after tweeting Dan to check that I could use 00 pasta flour (Ocado only sell some fancy schmanzy organic stuff and I didn't have time to hit Sainsburys this week), not only did he reply but he also posted my comment on the Guardian website. What a star. If only all chefs/bakers/authors/journos were like him - the world would be a happier place. I think everyone should try this recipe. It may be lengthy but it's pretty foolproof. And it's fully worth it - you'll never put up with supermarket danish again. You can find the recipe here. I will definitely be giving these a go in the near future :o) These looked so yummy. Oh my goodness - these look so good!! I also tweeted him, with a query when making his naan's and he got straight back to me....really helpful. 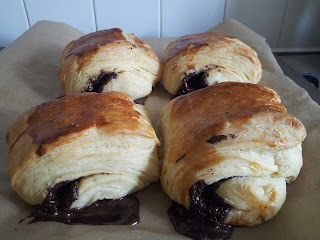 They look amazing, I really must try a laminated dough, and it looks like these work really well. Hope they tasted as fabulous as they look! Jules, you should definitely give them a go. Recipe works like a dream. Was so pleased after previous disaster. 52bakesncakes, I love those naan. It's one recipe my husband actually likes and I now use it weekly.